EffOne offers a range of Blackberry application management services that helps organizations introduce innovative & cutting edge apps. Our clients have found our services most economically viable with world class quality & excellent go-to market achievements. Our BlackBerry app developers deliver personalized & interactive applications to meet your expectations. Our team focuses on technical benefits & business objectives thereby ensuring excellent return on your investments. We have worked on multiple BlackBerry phones like Curve, Storm, pearl & Z10. 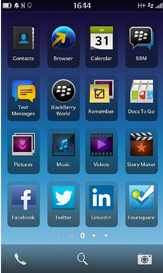 Why choose BlackBerry Application Development from EffOne? Our team of BlackBerry developers has vast experience in developing different type of applications for various sectors and providing the best solution to our clients. Our process is complete in structure and seamless in manner to suit your needs and requirements. Our team uses the best practice & assures that the applications developed match the industry standards in terms of performance and reliability.